Thanks for listening to me vent about my sore finger. I'm hoping it will feel better quickly! Thanks also for the kind comments about the afghan and I'd be glad to share the details. Here's a link to the pattern, which is available for free. 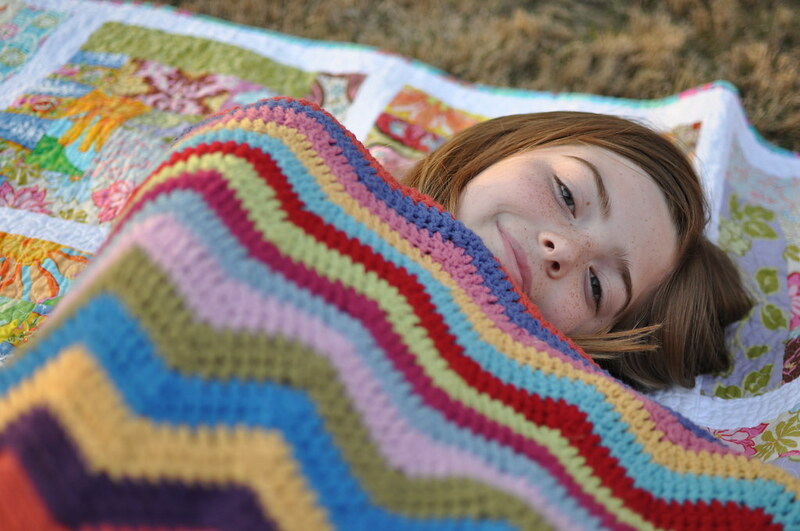 It's called the Easy Ripple Afghan, and it is really is easy and fast too. I'm using Lion Brand Cotton-Ease and a 4.5 mm (G) hook. I really like Cotton-Ease. It's 50% cotton/50% acrylic, but it feels like cotton. It washes beautifully and holds up well. 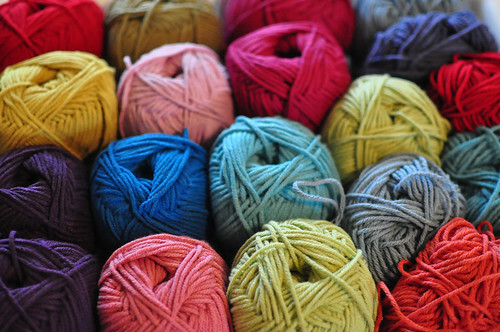 I bought every bright color I could find locally and then ordered the other brights from Knitting Warehouse. I think I'm using about 14 colors in a random stripe. I love the weight and hand of cotton blankets. To me, cotton almost feels cool to the touch. Perfect for spring! I love the bright colors in your afghan. Great to see that you found the new location of my website and the Easy Ripple Afghan pattern. I like seeing how people make their afghans. No 2 are alike. Just gorgeous! Your daughter looks like she likes it too! I have always wanted to make a ripple wave afghan, so thanks for providing the link to the pattern. I forgot where it came from. That yarn and the colors you chose make this project look so inviting and warm feeling. Hope your finger gets better so you can keep going! 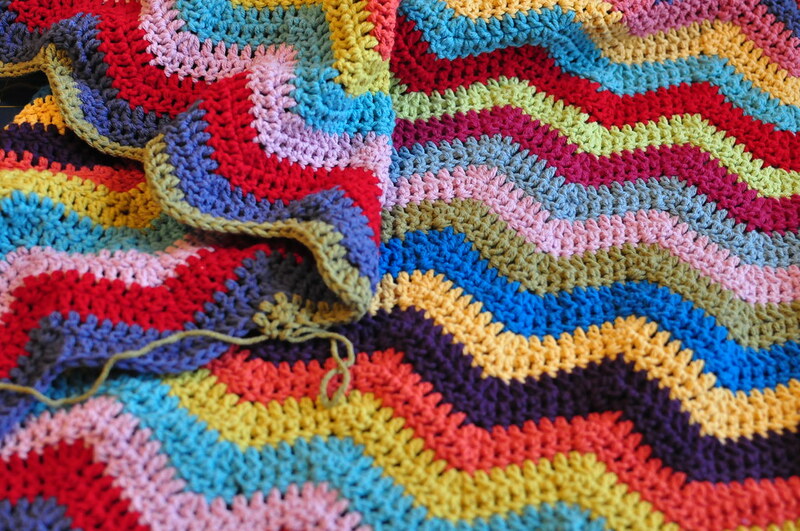 I love ripple wave afghans, and the rainbow of colors you chose are great. I would have to say the most adorable part of the pictures is your sweet daughter all curled up and snuggly. Sorry about your finger...that really stinks (ur going to go into hex withdrawals if it doesn't heal up fast)....bad beemer!! Thanks for the link! I really like all of the colors you are using. I hope your finger is feeling better soon! I love the colors in that afghan. And your daughter looks precious snuggling underneath it. I stumbled across your blog and I am so happy I did. I really like this blanket. The colors are perfect and I have searched you tube videos to see if I could teach myself how to do some simple crocheting. What do you think; is it something you can teach yourself??? I just love the vintage/modern mix of this blanket! Hope you have a great weekend. Thank you for all the info on the ripple afghan!! Excited to get myself some yarn and start being busy while watching TV at night. I was spending the time pressing my paintbox blocks, but now they are Done!! So I need something new so I can multi task at night. Wanted you to know you inspired me to take my crafts outside with your outside afghan photos. At our house we usually all head outside after dinner for a bit if the weather is good. I always would rather stay in and work on my quilting but go outside anyway. Well...last week I took a small wall hanging outside with me and put the whole binding on!! I was still able to watch the kids, and talk with the hubby but I was busy, yeah!! I will be able to crochet outside too. Who'd a thunk it??? I just found your blog tonight. So glad I did! Beautiful creations for sure. I loveee your ripple afghan!! Awesome colors. I'm working on one now but your colors are much prettier.